Unions feed the PEOPLE! Join us for a FREE Labour Day BBQ! Local Y010 and many other Labour groups will be flipping burgers and shucking corn Monday September 1st, celebrating Labour Day in Shipyards Park! Each year YEU’s largest local sponsors a massive community feast, inviting everyone to join the party. There’s free food, entertainment, old time games for the kids, a bouncy castle and even face painting! Best of all?! AIR NORTH has donated a round trip ticket for one between Whitehorse and Calgary, Edmonton or Vancouver. SERIOUSLY!! Everyone who attends is eligible to enter the draw to win this fantastic prize!! The party starts at 11 and wraps up at 2 – you’ve never SEEN so many burgers and dogs in one place! Volunteers still needed! Contact organizer Tammi Sikorski if you have a few hours to spare; email her or call 335-1329. If you have some time on your hands and feel like pitching in, WE NEED YOU! If you’re a whiz at cutting vegetables, have some kids who’d love to shuck corn or have a king of the grill in your house …. we would LOVE to share the fun. The folks from the Whitehorse Food Bank will be on hand to collect donations of food and/or cash! If you are able, please bring a donation of a non-perishable food item. Visit the event’s Facebook page! Y010; keeping the Unity in Community. Please join us! This is an all ages event, great for the whole family. The Food Bank Challenge… look what we DID!! When Whitehorse Food Bank‘s Executive Director Stephen Dunbar-Edge told CBC reporter Sandi Coleman things were looking bad he wasn’t kidding; the shelves were dangerously bare and emergency food hampers for the 1200 monthly clients were at risk. YEU Local Y010 President Tammi Sikorski heard Stephen’s interview and decided to see how the Union could help. She spoke with her Local’s Executive and together they pledged what they could, issuing a challenge to other Locals to match their $700 donation. What happened next is the sort of thing that makes us all proud to be Yukoners. Yukon Employees’ Union announced they would match the total donations pledged by the Locals, and issued a challenge to its membership. 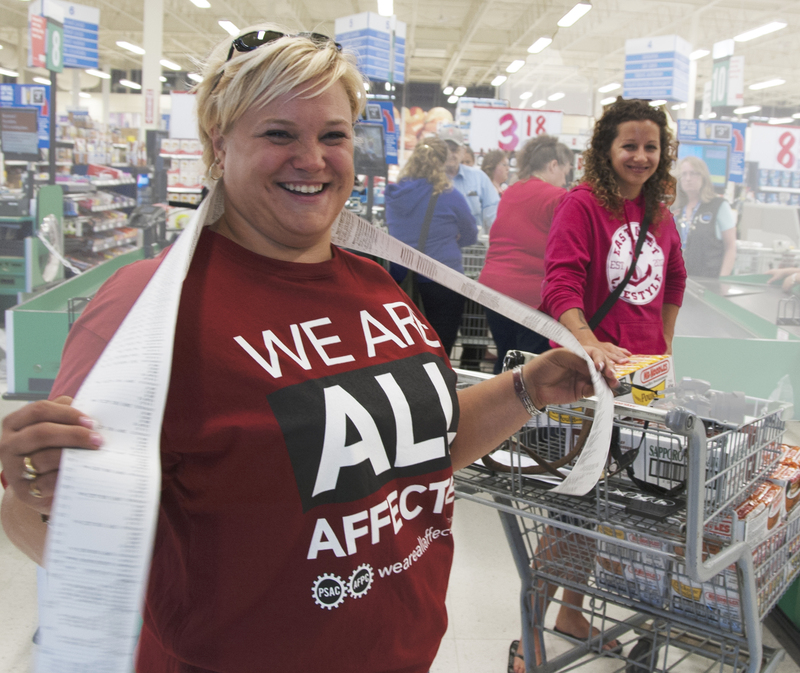 Members were encouraged to make individual grocery purchases of $50 & take a photo of their purchase, posting it to the Yukon Employees’ Union Facebook page. By delivering food directly to the Food Bank with a grocery receipt, name & address, donors receive a taxable donation receipt at the end of the tax year; that’s a win-win. We also invited our members to join us for a massive scale shopping extravaganza on Saturday August 2nd. About 20 keen volunteers with carts and HUGE shopping lists loaded the Food Bank’s van and the Y010 trailer to the rafters, then delivered and shelved food at the Food Bank’s Alexander Street location. It was fantastic, energizing and FUN! It reminded all of us once again that unions really help keep the Unity in Community, and YE-Unity is pretty impressive! The Food Bank needs consistent support. That support can be food or financial donations, but to provide emergency food for individuals and families in crisis they, need sustainable and reliable funding they can count on. Consider becoming a Food Bank donor. The donation options are outlined on their website. Green Apple donors agree to a monthly contribution of $10 or more, allowing a predictable income and operating budget for the organization. Want to volunteer? Contact them at 393-BANK(2265) or through their website, www.whitehorsefoodbank.ca. Volunteers are always needed and summer is a particularly challenging time, with many volunteers away. Thank you to everyone who participated in our fund and food drive. We want to extend our gratitude to the folks at Superstore too; they added $200 to our shopping budget and waived a bulk order fee allowing us to spend all the donated funds on much needed food. In all, Locals Y010, Y011, Y023, Y017 and Y024 and Y034 made donations which, when matched by YEU totalled $6500. Thanks everyone!